Secret Recipe Club gets more exciting every time! This time I was assigned Melissa's blog Fried Ice and Donut holes. Going through Melissa's blog it doesn't take one long to realize how passionate she is about food. Each recipe is presented with finesse and is so detailed that one can hardly go wrong. I chose this recipe since I've been wanting to prepare ravioli since a long time and this one sounded so yum! I love the way the herbs are used in the filling and the sauce. It was a pleasure to pick up fresh herbs from my garden and use them in this lovely dish. I replaced white flour with wholewheat and finger millet to make it a healthier version. I didn't have ricotta as well, so I used cottage cheese for the filling. Apart from these changes I was true to the recipe. Sift the flour into a large pile on a flat surface. Make a fist-size well in the center and add the eggs, salt and water. With a fork gradually whisk the eggs to incorporate the flour. Add more water or flour(ragi) as needed until a firm dough is formed. Knead the dough for 2-3 minutes, or until smooth. Wrap with cling film and allow to rest for 30 minutes, before rolling out and cutting into desired shape. Place the corn kernels in the food processor and pulse until coarsely chopped. In a bowl combine the corn, crumbled paneer, egg, cream, salt, pepper, and herbs until well blended. Divide the dough into quarters and roll out each into thin sheets with a rolling pin. Drop about 1tsp of filling into the center of each ravioli , spacing the centers about 2 inches apart. Moisten the edges with water and top with another sheet of pasta dough. Press to seal. Cut apart using a cutter and crimp the edges with a fork to thoroughly seal. 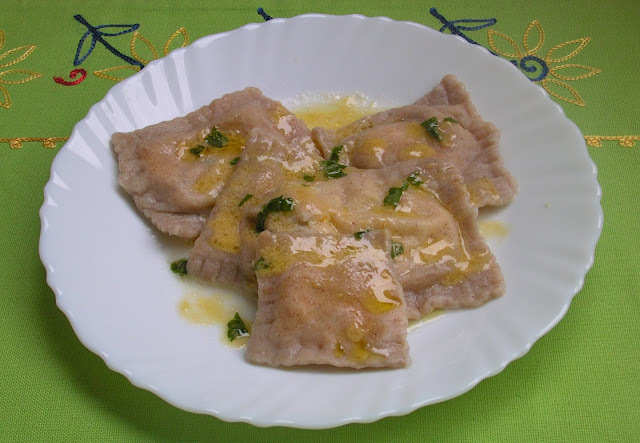 The ravioli can be made up to a day ahead of time, arrange in a single layer and sprinkle with flour. Cover with cling film and refrigerate until ready to cook. Transfer to a zip lock bag after completely frozen. Boil in water till al dente. Transfer with serving spoon to serving dishes. Reserve about 1/4 cup of pasta water. Heat the skillet over medium heat, add the wine and simmer until reduced slightly about 2 minutes. Add the cream and butter and simmer until thickened 3-5 minutes whisking constantly to prevent the cream from scorching. If needed add the reserved pasta water 1 spoon at a time till the sauce is the consistency of a thick cream. Stir in the chopped herbs and spoon over the ravioli. Top with grated cheese if desired. What a delicious filling for ravioli! I've love to make my own ravioli. I bought a ravioli tray recently but have not gotten round to using it. The filling sounds delicious as I love corn. Great SRC pick! Thanks for the kind words! I'm so glad you chose this recipe. It is definitely one of my favorites!! (sorry if this is a double...I don't know if it went through) Thanks for the kind words! I'm so glad you chose this recipe. It is one of my favorites!! I've been wanting to try to make ravioli for a while..yours looks delicious! Great SRC pick! Great recipe for a decent meal! There's nothing like fresh ravioli! Oh wow! I've been wanting to try making my own ravioli again, and adding corn and fresh herbs sounds so fun and delicious! Great SRC pick! I have never made my own ravioli but I think you have just motivated me to try. Great SRC choice, thanks! This I'm definitely going to make..its just full of all well-loved flavours! This sounds like the perfect summer recipe! Great choice for SRC! Shirley, lovely ravioli. Have a great week. PS Thank you so much for following Carole's Chatter. A warm welcome to you! If you are a parent looking for ways to enrich your kid, strengthen immunity and facilitate growth do go through all my posts. If you are not a parent you are welcome to try my recipes too and expand your knowledge about healthy foods for healthy living. Dont forget to leave your comments and ratings. You can sign up for regular updates, so that you dont miss any.